The Friday Fun & Easy Landscape Challenge Apr. 20 – Apr. 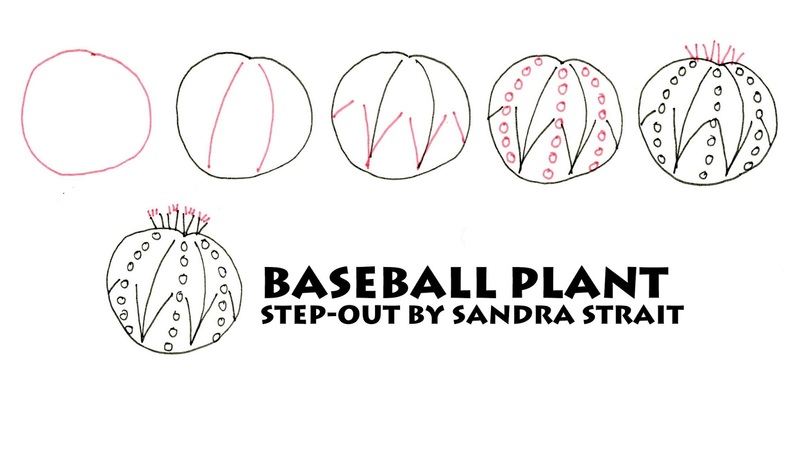 26: Draw a landscape using the Baseball Plant step-out. Extra calorie-free brownie points for using one or more of the Penguin Family in your drawing. Don’t sweat the circle shapes – there are no perfect circles in nature so why should yours be? This step-out is inspired by a subtropical succulent, but you can have it occurring anywhere you want. Even at a baseball game! Wouldn’t they make nice adornment for the arena. Draw it big, and it makes a nice focal point. Draw it small, and it can add interest to your landscape without grabbing the focus. Try using them instead rocks in your next drawing. 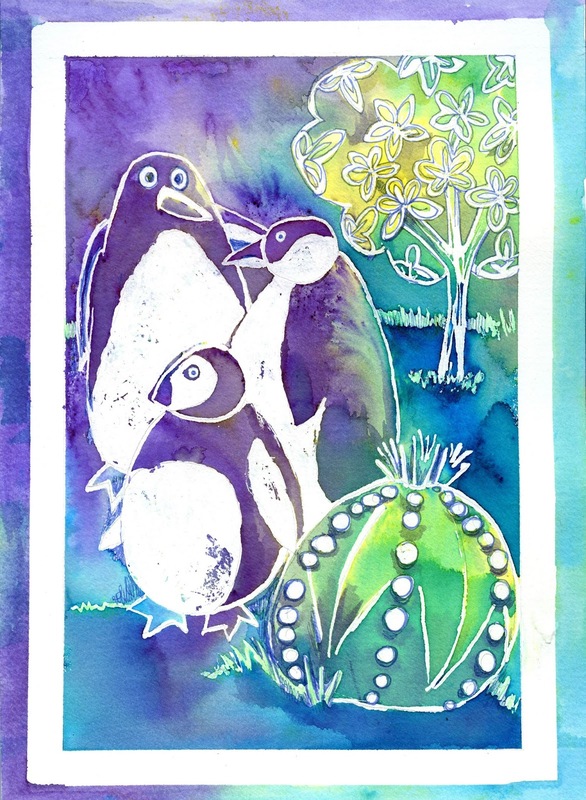 This example was done by drawing the picture with masking fluid and applying masking tape to reserve the white areas. Then I used Brusho crystals for the color (you wet the page, drop in the crystals and tilt the page to move the color). Once dried and the masking fluid removed, I used Sarasa fineliners to outline a few areas like the Popcorn Leaves tree. This is approximately 8.3 x 11.7 inches in size. Using the masking fluid took the longest, but not including the drying time, this took about 30-45 minutes to do. The drying time added another 15-20 minutes. Great for someone who doesn’t have much time because you can do it all in chunks. Apply the masking tape. Draw the masking fluid picture: 15-20 minutes. Go off and do something else while the masking fluid dries. Wet the paper, add the Brusho crystals, tilt the paper around: 10-15 minutes. Go off and do something else while the paint dries. Remove the masking fluid and tape. Outline areas that need it. 10-15 minutes. The time will vary of course, depending on how complex your drawing is and how wet you get the paper – and the paper itself will make a difference. I did this on the new Hahnemühle Harmony Cold Pressed Paper, which I’ll be reviewing soon. I really like it and it handled the masking fluid, masking tape and huge amounts of water with no tearing, no dimpling and very little curl. Join the Fun & Easy Landscape Facebook Group here!